By Hollywood reporting royal decree, Amy Schumer is the undisputed Queen Of Comedy! So does that make LeBron the King? The Cleveland Cavalier wine and gold James made his silver screen debut this week with the Amy Schumer and Bill Hader hit comedy ‘Trainwreck’. The reviews are in…and they’re rave and not just for the brilliant Schumer and Hader, finally finding their leading moment in an against conventions rom-com, but ‘Bron too who defies all the above to send up himself in such a way that the critics can only love. Playing himself in more ways than one, LeBron James’ spoof of himself, a client under Bill Hader’s agent going all ‘Jerry Maguire’ is anything but a sports superstar screaming for the money to be shown. This film also features new Miami Heat star Amar’e Stoudemire in a hilarious cameo alongside the former South Beach talents of James. Nothing like comedian Chris Rock joking that in ‘Hustle & Flow’ rapper Ludacris “played himself”. Like the ‘Fast & Furious’ actor in Ashton Kutcher’s ‘No Strings Attached’, LeBron plays the best friend role perfectly, Esquire magazine calling his entrance ‘Kramer-esque’. With a ‘Seinfeld’ funny bone at 30 the King may have found a new calling. One that sees him ruling the cinema like he does the court. Whether the floor is sticky with sneakers or popcorn, James looks to make his mark. And it can’t come at a better time for LeBron. After losing out to the Golden State Warriors for the NBA Championship this season gone after carrying a Kyrie and Kevin depleted Cleveland team like a true Cavalier, James now shows he can shine in a supporting role in a different game. This must be a dream come true for the all-time superstar who has admitted to still being woke up with nightmares of losing the NBA Finals. If that sounds funny to some critics then the jokes on them now as the Cavalier star shows he has the comedy chops as well as the basketball brains. This was evident in those early days multi-personality Nike commercials, where the King went all grey and Old James before his Uncle Drew teammate took everyone to school. And who could forget ‘The Decision’ commercial? Where LeBron took his talents to the NFL Cleveland Browns and probably inspired a new generation of Gridiron goal dunkers. Now basketball’s biggest commercial king since Jordan is looking at more movies. And Like Mike the rumours are looking at ‘Space Jam 2’, which would be a joy to see. A whole lot better than ‘Kazaam 2’ anyway! Whether LeBron forms a big-three with Bugs and Taz remains to be seen on screen, but after wrecking the box office, hopping a train with Schumer and Hader it’s clear that’s not all folks! Man I hate that cliché. But like most things it’s only a cliché because it’s true. Hollywood is too. And the new standard to watch movies, the streaming service Netflix is the conglomerate now treating all their property like a commodity (Oops! Say those words). But still even though not in its purest cinematic form, Netflix gives storytelling lovers a library worth of lore for those who prefer to read the credits of a binged show than a book. And there’s no problem with that at all. Great stories are exactly that in whatever medium and whatever way they can be put out there and witnessed the better the exposure and availability to be seen (hash-tag the outstanding Oscar winning ‘Roma’ breaking the Academy Gold mold…or should we say “mould”). Besides in this post magazine age if it wasn’t for social media, streaming and the whole world wide web in itself how would we ourselves even operate on this level? Running rings round Hulu and even the prime delivery company of Amazon, Netflix have no chill. They own it all. Some of the biggest and best movies, even their own originals (right now the Ben Affleck special forces delivery ‘Triple Frontier’ with Oscar Isaac, Charlie Hunnam, Garrett Hedlund and Pedro Pascal is doing the rounds), crowning T.V. shows from the royal family to the ‘Narcos’ borders of Mexico and even a whole host of original documentaries. Forget Michael Jackson, it’s time you learned about what really happened to the great Sam Cooke. A change really has come. And just like the game, this brave new world is constantly in a flux of change in illuminating bright lights. What you thought was the standard can soon be a standing joke. This is an application so big they even had the power to Thanos all their street level Marvel hero series after Disney and Mickey Mouse took all the stones. This is just the new way of doing things. Just like in the game of Basketball where players have the power (King James and his Hollywood Magic Kingdom land) and a tweet can chance the timeline of history just as much as a bored, board meeting. They were once locked out and now they are free. But taking it back to that time and even complete with a meta moment to their new studio home, Netflix’s ‘High Flying Bird’ Basketball blockbuster movie shows us just how much has changed and just how much still goes on BTS (that’s millennial abbreviated talk for, “behind the scenes” for you and not a tribute to my favourite Korean Pop idols) when the screen lights in the high rises dim for the night. We are constantly on our phones (I say as I write this). Bird tweeting, liking, double-tapping, swiping right and snapping like turtles. And there is so much to plug into and binge (emphasis on has a word ever been more appropriate) that sometimes we forget where we are. Even a Basketball writer that reviews films as a side hustle can get lost in so much refreshing 24/7 cycles that he can take a month to review a damn Basketball movie and still not get round to his point (my bad). It’s the same as in this neon modern life as it is for this game. We are too busy trying to record that play for our own social account identity gratification that we can see in HD seconds from now all over the web that we actually miss the moment. We are too busy hating on certain athletes and running with toxic trolling trends because we fall for anything believe everything that is tweeted that we forget to take it pinch of salt back to the Basketball basics of the ball and that beautiful swish. We are all guilty of it. Even if we are just giving it our face in the phones-whilst our partner looks on unimpressed flicking between channels with the other remote before thinking about picking their own phone up and weighing up their own options-time of the day. We are too busy taking a selfie in our new jersey to see what is playing out there right in front of us. After its own ‘Amateur’ association production above the basketball rim, Netflix’s ‘High Flying Bird’ (that joins the ‘Coach Carter’ and ‘The Carter Effect’, ‘Iverson’ documentary likes of all you can stream on this service. Looking to be a movie that matches up with the big-three likes of ‘Hoosiers’, ‘Blue Chips’, ‘Glory Road’ and countless more on-court plays from ‘Uncle Drew’ to ‘Space Jam’ too) with its own Larry legend and Billy Edd Wheeler self-titled classic theme song explores these parallels and the time this all shifted and tectonic changed during the ball and old ways burning NBA lockout of a fair few, but still fresh years ago. Brought to a whole new court concept of modern day business and personal economic law by ‘Oceans’ and ‘Magic Mike’ XXL auteure director Steven Soderbergh (one of the best this movie game has ever seen on the tip top of his). Who once again revolutionised the game of this industry by filming the modern social cautionary tale of ‘Unsane’ on an iPhone, brings those same shot for shot dynamics as his documentary like filming, fish eye lens really captures the heart of New York City for Netflix (wait a minute…are those the Rand offices from ‘Iron Fist’?). Meatpacking Tribeca to new Freedom towering above. Even capturing the world’s most famous city when it sleeps in back office cubicles where the real decisions are made with a stroke of a pen and a swipe of a scroll. And this dull-slick tone (trust me that’s no insult, but the biggest of aesthetic compliments) really evokes the lockout lost feeling and the stunting silence of uncertainty in a young man’s world with the ball and future in his hands, but nowhere to play with. Especially in the city of Madison Square Garden. This slow burner is a meditation of what life is really like behind the business and what we really are playing for as the world turns like the ball spinning. That sacred essence. As Soderbergh takes it all the way back to ‘Predator’ legend Bill Duke’s rec gym and the kids who have the rock and the hard place of a great expectations in their future. But thankfully with the invincible joy of youth all they want to do is ball. And maybe catch a selfie for the ‘gram with the biggest one. 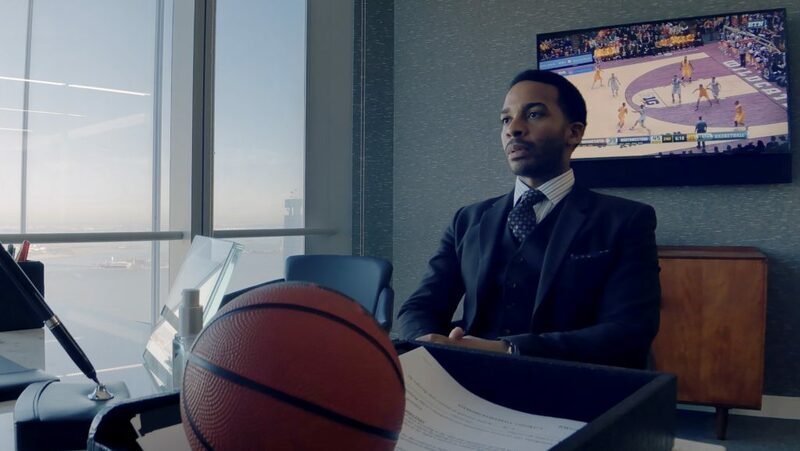 Executive produced by face to smoke screen mesmerizing ‘Moonlight’ actor André Holland, who is the real star of this show as a sports agent of change. Complete with restrained ‘Jerry Maguire’ charm for the real reason behind ‘This Is Why We Play’ (for the good looks not the big bucks) shows he can lead his own big picture like seeing one and effecting that change. He’s suited and booted with leading man depth and street and style tailored towards substance smarts and holds his own, counselling a crack cast. There’s ‘Atlanta’ and ‘Deadpool 2’ Domino star Zazie Beetz, who is probably the biggest star of them all right now and it shows. Hot rookie Melvin Gregg on his own inspired introduction. Spock himself in prospering ‘Heroes’ actor Zachary Quinto. ‘The Wire’s’ scene stealing Sonja Sohn. Netflix’s very own Caleb McLaughlin of ‘Stranger Things’ growing up. And ‘Twin Peaks’ legend Kyle MacLachlan all on “put me in coach” formidable form. Even real NBA players Reggie Jackson, Donovan Mitchell and Karl Anthony-Townes are fourth wall, black and white, Sprite logo commercial looking on hand for some true story method account to all this business madness. But none of these All Stars cast are going as dutch with the big ticket as Holland. André looking to take this game to places it’s never been before like 3000 is a new millennium outside the baseline thinker, and his old school knowledge is the perfect crossover of what this life and love for the peach and basket should be all about. Brand new, inspired innovations meeting tried and tested, old smarts. Because here’s another cliché for you that rings just as true. “You can’t really know where you are going, until you know where you have been”. Word to Maya Angelou. And Netflix and it’s ‘High Flying Bird’ with its head in the clouds but its sneakers on the hardwood asphalt are heading in the right direction.